35th year of serving the Greater New Orleans Area!! Eastbank and Westbank, Jefferson, St. Charles, St. John, Tangipahoa & Western St. Tammany Parishes. Under same ownership since 1981. ARE YOU HAVING YOUR HOME RAISED OR LEVELED? IF YOU HAVE A TERMITE CONTRACT, THIS WILL VOID IT. YOU NEED TO HAVE IT RETREATED. Most companies who raise houses include the cost of retreating your property for termites. Licensed, Bonded & Insured. Certified for Real Estate Termite Reports for prospective homeowners or refinancing. As you are rebuilding or remodeling don’t forget to protect your home from Termites and other pests. Offering GREEN Solutions for your pest problems. Has earned a reputation second to none. A long time member of the Better Business Bureau, Louisiana Pest Control Assn., Greater New Orleans Pest Control Assn. and NFIB. A long time member of Kiwanis a service organization. 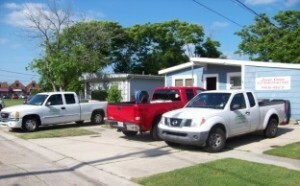 Hundreds of satisfied residential and commercial customers. Designed by Fatcat Web Designs.